France has lodgings that range from very affordable to very expensive, although the inexpensive options are fewer than in many other countries. One of these is the Formula 1 hotel, a very basic hotel found outside cities and by the highways. Another affordable option is the youth hostel, or “auberge de jeunesse.” In the south of France, family-owned hotels provide less expensive places to stay. In addition, in rural areas with high tourism, some home-owners offer rooms in their houses to tourists. 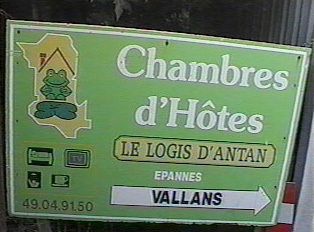 These are called “chambre d’hotes” and are not visibly advertised but can be found in special tourist guides such as the Le Guide Du Routard , a guide for backpackers. Camping may or may not be cheaper than these private rooms. Paris, as every metropolis, is a very expensive place to stay. For those wanting an extended visit, it makes sense to rent a “studio” (a studio apartment), which also happens to be the most common living arrangement for French students. Advertisements for these are found posted in university student centers as well as in windows of available apartments. "I Would Like a Room for Two People"
"I Would Like a Room With Twin Beds"
"Making a Hotel Reservation "